The ®treecups 400 are made from renewable raw materials and naturally occurring minerals. They are absolutely scratch and impact resistant. For the upcoming World Cup with the Germany colors printed. Multi-use cups by NOWASTE® are 100% CO²-friendly, free of any harming substances and completely bio-degradable. 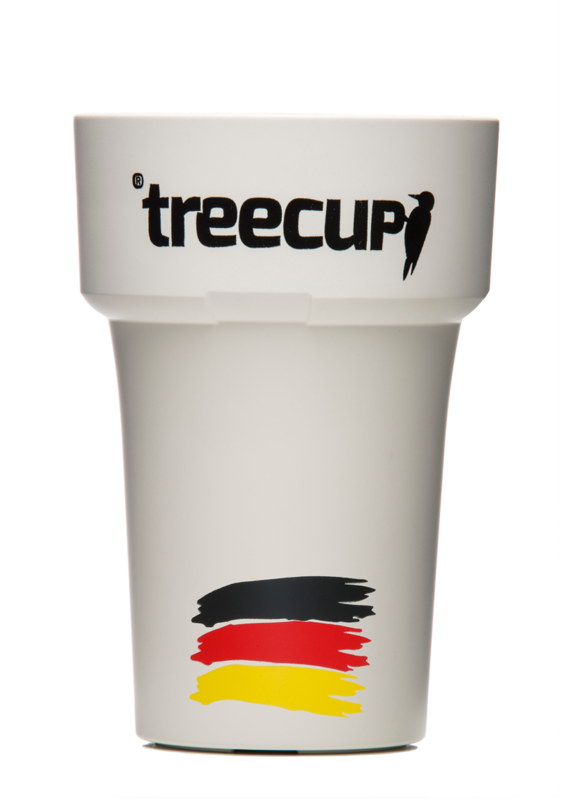 TREE CUPS BY NOWASTE® ARE AN INNOVATIVE AND UNIQUE PRODUCT MADE IN GERMANY. The colorful and diverse range of stackable & printed multi-use cups is 100% natural, climate-neutral and fully biodegradable.The biodegradability of the products has been checked and certified by the internationally recognized and independent institute OWS in Belgium in accordance with the examinatin regulations DINEN13432. Dishwasher safe and stackable – the Tree cups 400 by NOWASTE® offer a wide range of applications. The heat resistance of the cups (up to 110 ° C) makes it possible to enjoy both cold and hot drinks. The cup is well-held, robust and can be transported comfortably also with hot contents. The colored heat protection sleeves made of natural wool ensure a colorful design of the drinking cup even in everyday life. With a filling height of 0,4l, our reusable cups offer you enough volume to sweeten your day with a good environmental conscience. In addition you protect your fingers when transporting hot drinks. The Tree Cups can be customized by printing and can also be used as an attractive advertising space. For the perfect and contemporary to-go enjoyment, the multi-use cup can also be supplemented by a silicone cover. With these characteristics, the cup is suitable for use in any area of life.